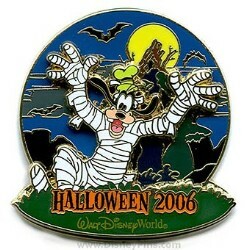 Mummy Goofy scares up fun in front of the Splash Mountain Attraction at Magic Kingdom Park in this Limited Edition pin. This pin is part of the Haunted Parks 2006 Collection, and Goofy is a pin on pin. Art for this pin was created by Disney Design Group Artist Tyler Dumas.